Say 7 "Hail Marys", while meditating on the Sorrow. Repeat 3 and 4 continuing on through all seven Sorrows. Say 3 "Hail Marys" in honour of the tears of our Most Sorrowful Mother. 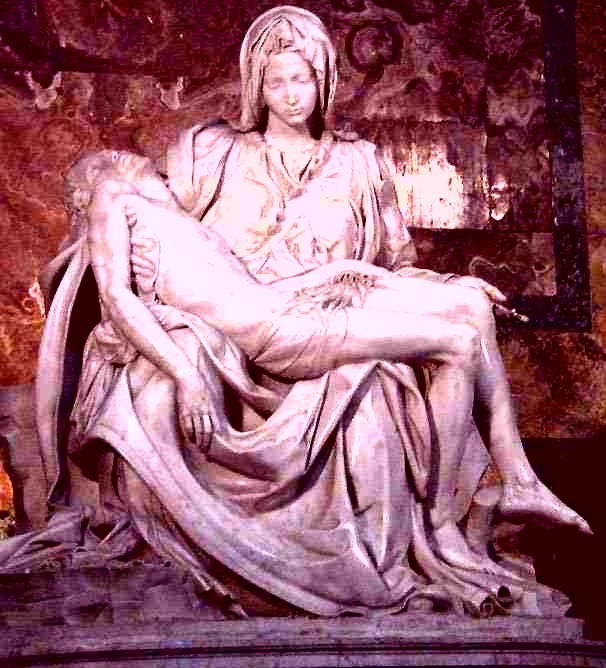 Michelangelo's famous PIETA in St Peter's Basilica, Vatican City. Mary and Joseph presented Jesus at the Temple, in accordance with the law concerning First-born sons. And Simeon blessed them, and said to Mary His mother, "Behold this child is destined for the fall and the rise of many in Israel, and for a sign that shall be contradicted, and thy own soul a sword shall pierce, that the thoughts of many hearts may be revealed." And she was infused from On High, with a true understandig of the future sacrifice her Son would make , and His horrible scourging and death on the Cross. This produced in her an incredible sadness which she willingly accepted as her lot. An angel of the Lord appeared in a dream to Joseph, saying, "Arise and take the child and His mother, and flee into Egypt, and remain there until I tell thee. For Herod will seek the child to destroy Him." And so in the dead of night, they set out out in great sorrow and distress to travel to Egypt. And his parents were wont to go every year to Jerusalem at the Feast of the Passover. And when they were returning, the boy Jesus, then twelve years old, remained in Jerusalem, and his parents did not know it. And it came to pass that after three days of sorrowful searching they found Him in the temple, sitting in the midst of the teachers, and amazing them with his understanding and wisdom. Here was Mary, entrusted by God with bearing and bringing up His only Son - and she had lost Him! It would be virtually impossible for any other huiman being to feel the depths of sorrow which would have consumed Mary at this time. FOURTH SORROW - Mary meets Jesus on the way to Calvary. Beyond all human thought and estimation was the sorrow of the Most sincere Virgin Mother, while she thus witnessed with her own tear-filled eyes, her Son, carrying the Cross to Mount Calvary. It would have been impossible for her to live through this ordeal if the Divine Power had not strengthened her, and preserved her life. Now there were standing by the Cross of Jesus, His mother, and His mother's sister, Mary of Cleophas, and Mary Magdalen, in deep sorrow. When Jesus therefore saw His mother and the disciple standing by, whom He loved, He said to His mother, "Woman, behold, thy son." Can you possibly imagine the intense sorrow you would feel if you had to stand and watch your only Son be thus treated? SIXTH SORROW - Mary receives the torn and bloodied Body of Jesus, taken down from the Cross. Joseph of Arimathea and Nikodemus came to take down the Body of Jesus and arrange its burial. They placed a ladder against the Cross, and first removed the Crown of Thorns reverently and the nails, and passed them down to Mary. In order to assist Joseph and Nikodemus, Saint John supported the head, and Mary Magdalen the feet of Christ, and thus tearfully and reverently placed him in the arms of His sweetest mother. This was to her an event of mixed sorrow and consolation. SEVENTH SORROW - The Body of Jesus is placed in the Tomb. Some time passed during which the sorrowful Mother held at her breast the dead Jesus, and as evening was far advancing, Saint John and Joseph besought her to allow the burial of her Son and God to proceed. The most prudent Mother yielded, and they now embalmed the sacred Body, and placed it on a bier to be carried to the Tomb. A procession of heavenly spirits was formed, and joined by other men and women, and the sacred body was borne along by Saint John, Joseph and Nikodemus and the Centurion. They were followd by the Blessed Mother, by Mary Magdalen, the rest of the women disciples, and a large number of the faithful. All of them, in silence and in tears, proceeded to a nearby garden, in which there was a newly-hewn rock grave. In this most blessed sepulchre they placed the sacred Body of Christ, and closed it with a very heavy stone.